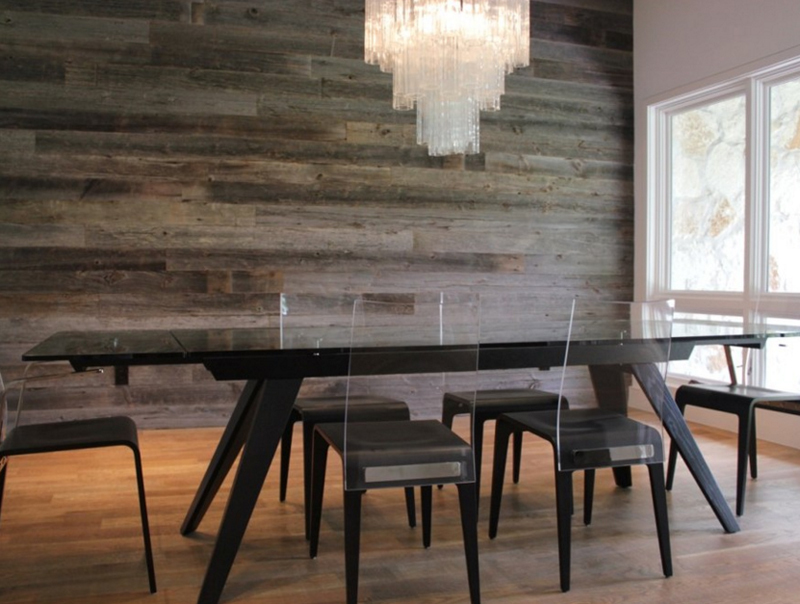 Reclaimed wood looks lovely in different spaces of the house even in the dining area. When we talk about reclaimed wood, it could either mean that the wood was rescued from its undesirable state or was restored to a previous natural state. I know of a group here in the Philippines that use reclaimed wood to encourage teenagers to create art works that they display in their organization office. The wood that they use are drift woods that they were able to pick up during beach clean ups. This organization is basically doing a small thing for greater causes – in terms of design – furniture or in home design, designers or clients help each other in making sure that in using reclaimed wood, they are able to save cost, save the search for building materials and save Mother Earth. 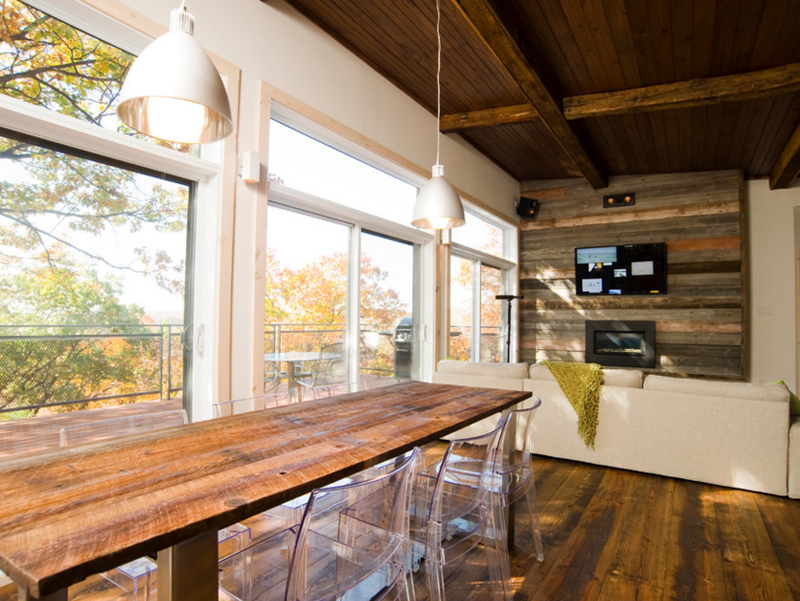 The method of using reclaimed wood is not only budget-friendly but eco-friendly too. 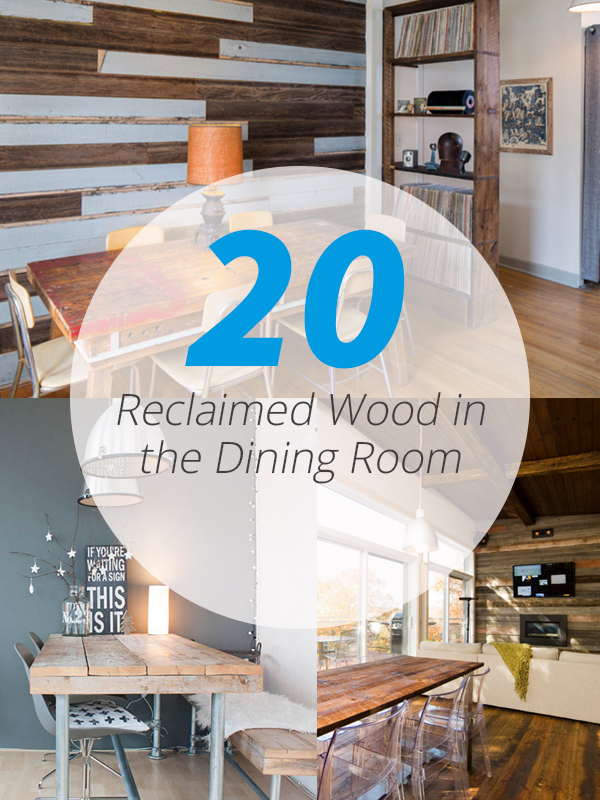 Check out the pictures below with few of the best reclaimed wood projects. What I like most about this dining room is the fact that it faces a door wherein you see the outdoors and enjoy it while you’re actually eating; and the fact that they used reclaimed wood on the chairs and the table – I even think that the floors are made from reclaimed wood too. So in general, this dining space is not only beautiful but very Earth-friendly. 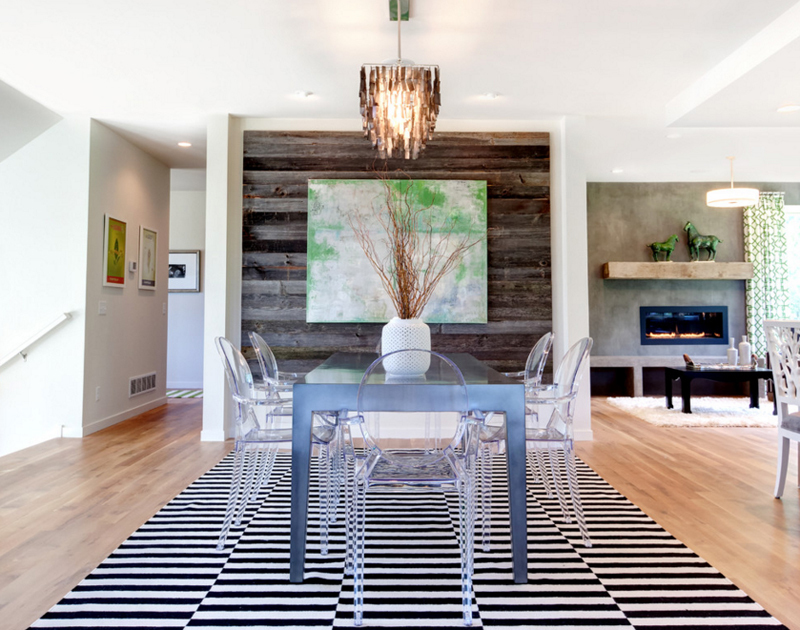 The stunning table in this picture is made from reclaimed wood. Don’t you just think that it’s so lovely? The color is great plus the seating is comfortable – something that we always look for in a great dining room set, right? The color palette of this dining room is nice and Earthy; aside from browns, the use of orange-brown for the chairs and the color of the area carpet – I think the color combination is really neat. This color combo is helpful to the eyes because obviously it does not strain or hurt it. 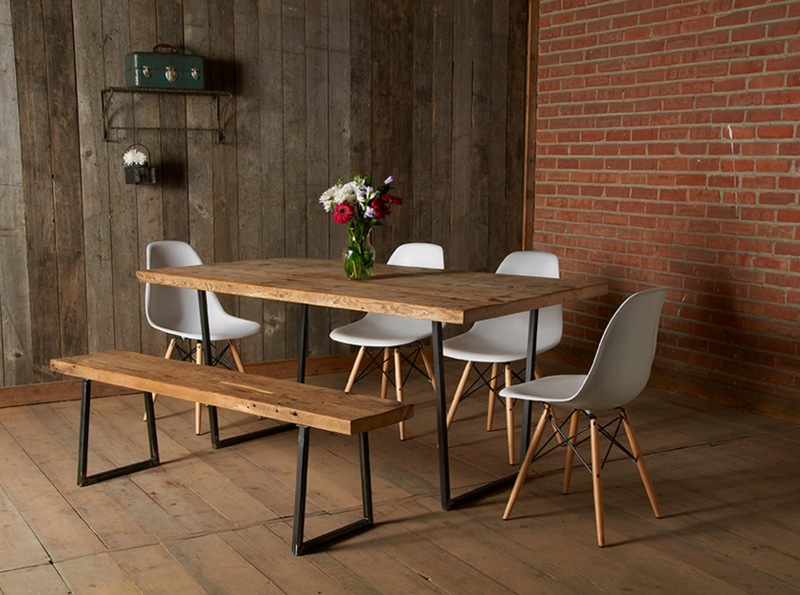 The reclaimed table is made modern by adding stainless steel legs. The use of reclaimed wood in the table gives an authentic vintage feeling in this particular dining area. The ambience is set wholly with the help of the candle chandelier and the wine holder. The vintage-modern atmosphere is created by the balance of the wooden table and the leather chairs along with the lighting and the neutral-colored curtains. The dark color of the reclaimed wood used in this table is neat and pleasant to the eyes, not to mention, long and perfect for vacations and big family get-togethers. 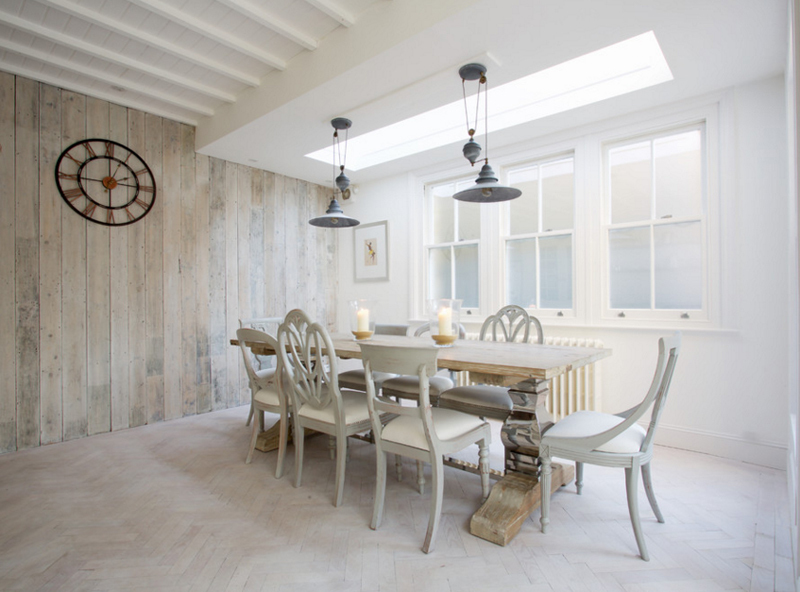 The white walls in this dining area widens the space to go along with the long and dark reclaimed wooden table. The neutral tones of the dining room accents such as the lighting fixture, the chairs, and the framed paintings are a perfect combination in an area in a Prairie House like this one. 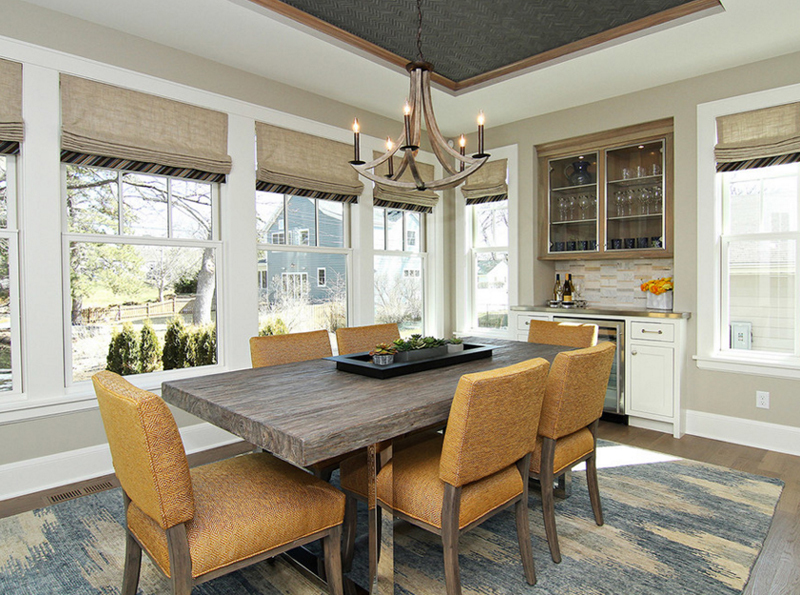 This dining area looks as if it has been lifted from a TV series where the characters live in a simple yet chic loft. The table and walls of this dining room space share a contrast in color and wood size but these just complement the entire look and ambience of the area. And in addition, I really just love this brick wall! It completes the entire vintage and rustic vibe in this space. The upholstery of the mismatched dining chairs in this house look so comfortable and very pleasant to look at. 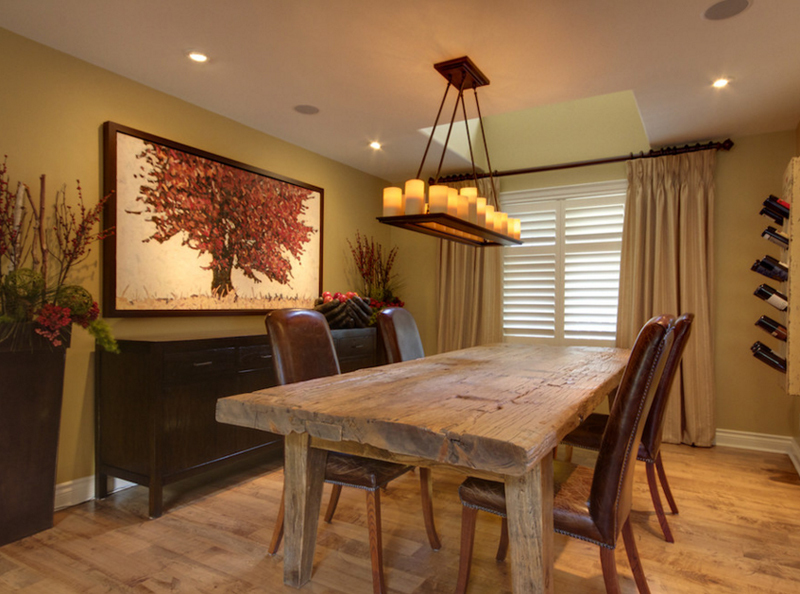 The light shade of the reclaimed wood on the walls and table create a more spacious vibe in this dining room. The white ceiling and walls along with the vintage lighting fixtures are simply adorable that go perfect with the wood panels. The accent wall and the dining room table, even the book shelf seen in this eclectic dining space is made from reclaimed wood. What do you think about this space then? I personally love the table because you definitely see how neat and functional it is while the accent wall is basically for show; and well, the book shelf is useful too, but still, the best in usage for me is the table. 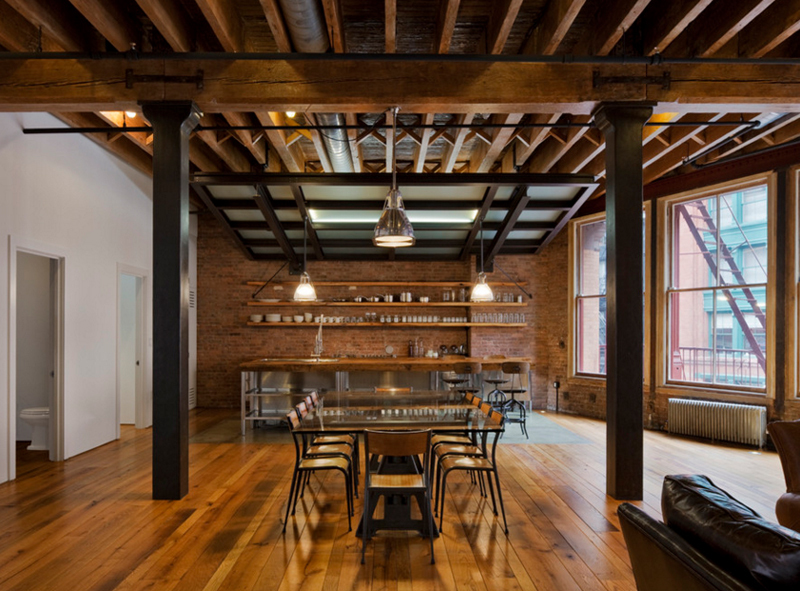 I have already featured a couple of spaces in this beautiful loft. This sure is quite large making its way for parties and get-togethers. 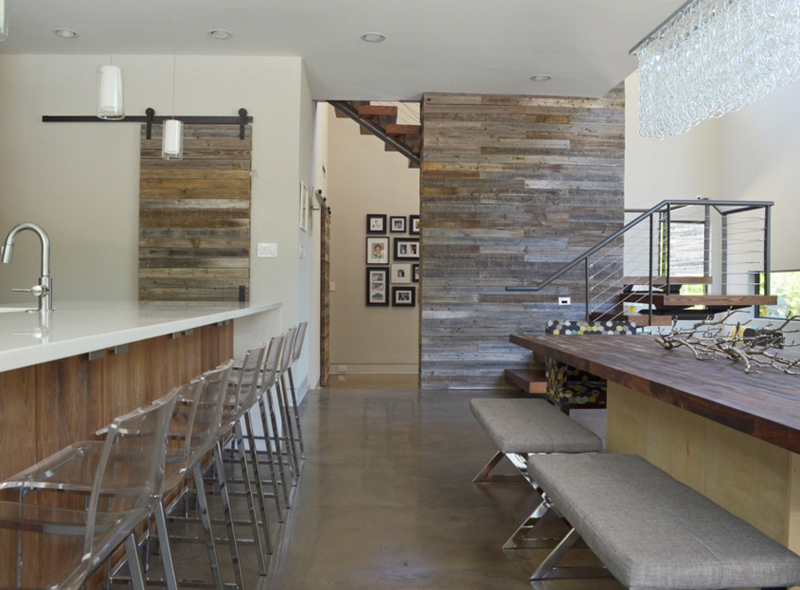 The use of reclaimed wood on the floors, the beams and the shelves is just fascinating; I love what they did on them. 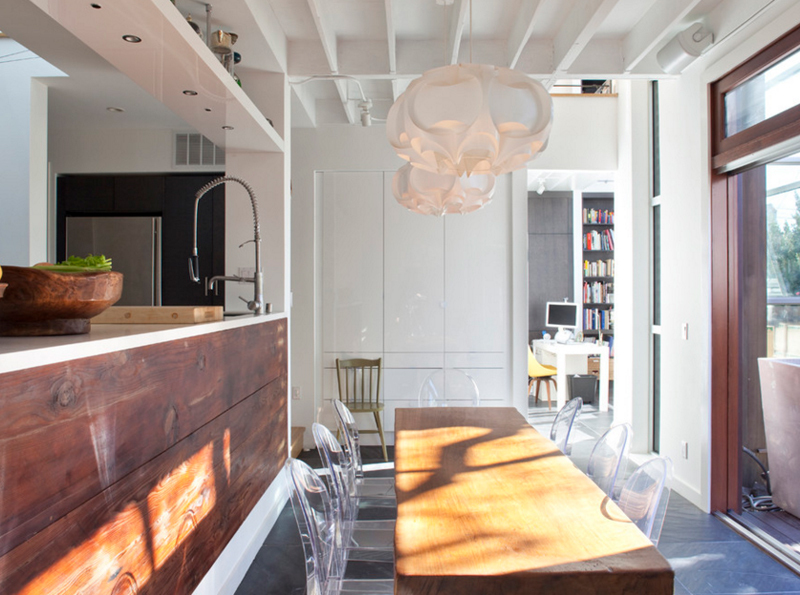 The combination of the reclaimed wooden table and the ghost chairs is just fascinating. It’s like the mix of vintage and contemporary that actually works. Another thing that I think makes this space beautiful – is the fact that it opens to the backyard of the house which allows for them to have fresh air while dining. The staging of this dining room is a bit rustic and cowboy-ish; well that’s for me. 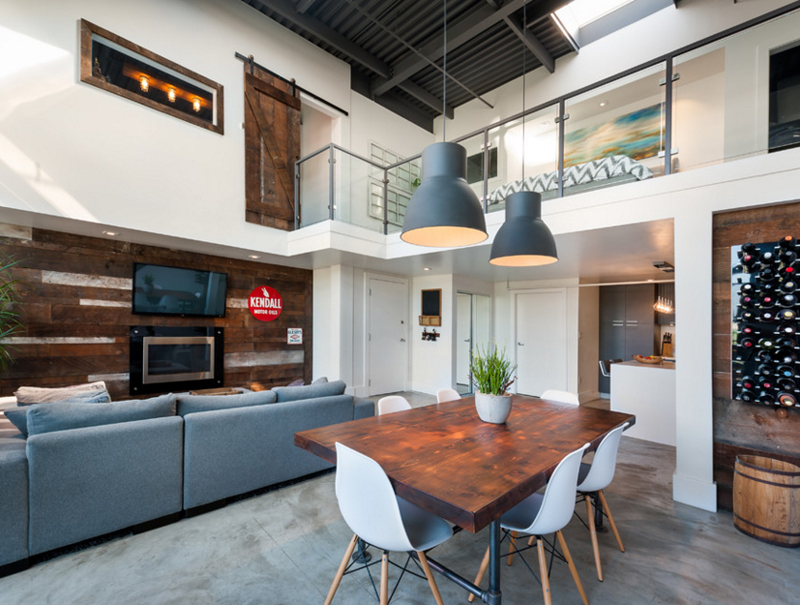 The use of reclaimed wood for the accent wall was a great way to create a different kind of aura that the design of this space has. 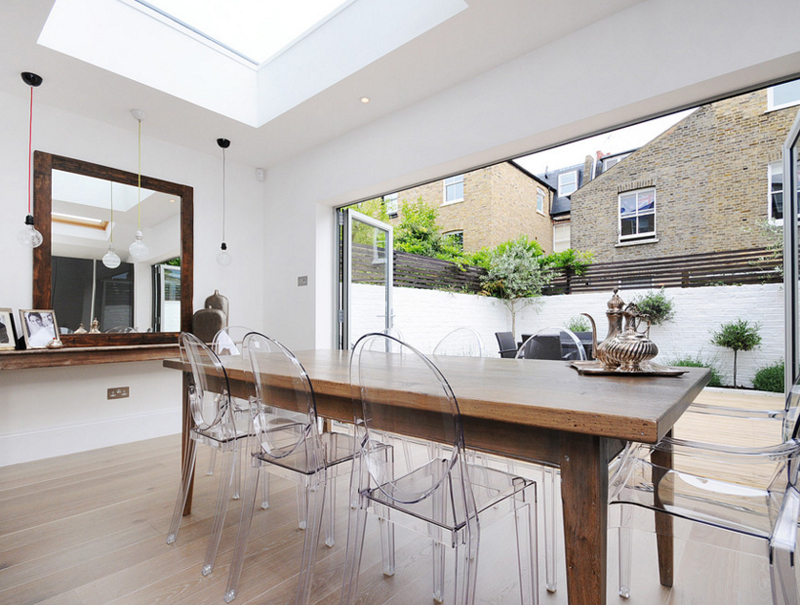 I particularly love the hanging pendant light that seems to have been specially done for this home alone. Plus points for exclusivity. I know that it’s somehow rare to find a reclaimed wood that is painted to have a light color. This is unusual because we see reclaimed wood to have a dark brown or even so close to black shade for that reclaimed wood look – but I think that rare as it is, this dining table looks fab! Plus points for the pendant lights in here! Love the color of the table and the floor? How about the color of the pallet that serves as an accent wall by the living area? The color of the table is second in beauty for me because I like the combination of the color on the pallet. In this angle, this New Leaf dining-kitchen area sure is beautiful. 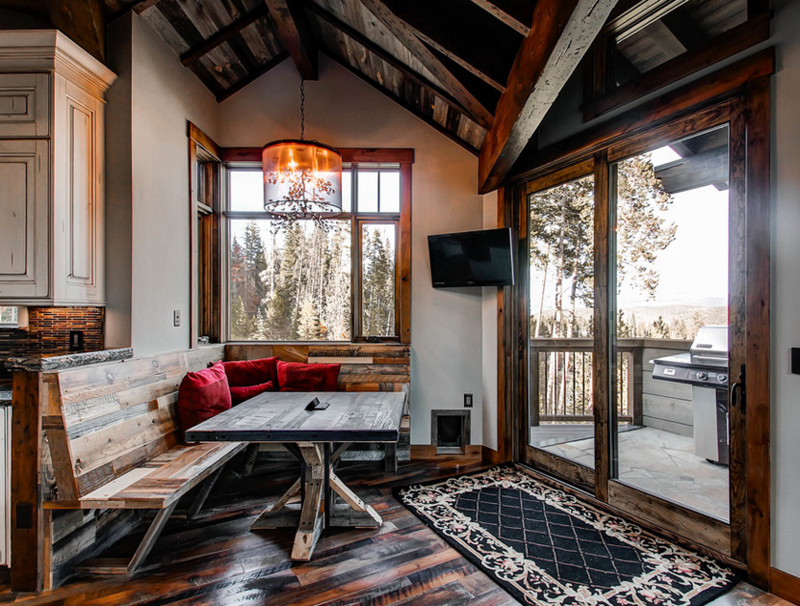 The use of reclaimed wood is very evident and I think that this is a good thing because it showcases the fact that they considered eco-friendly materials and I think people would definitely appreciate that. It’s somehow weird for me why the created an elevated bar, I mean, I’m short so I won’t be able to utilize the kitchen bar this high. Though I know aesthetically this space is really beautiful, I still am bothered with the bar. The lovely reclaimed wooden table is beautiful, it goes well with the chairs, the stunning floors and the gorgeous circular pendant lamps. The common combination of white and browns is one of my favorites because it shows the cleanliness of the space while making it really eco-friendly (whether or not it applies of the design or not). 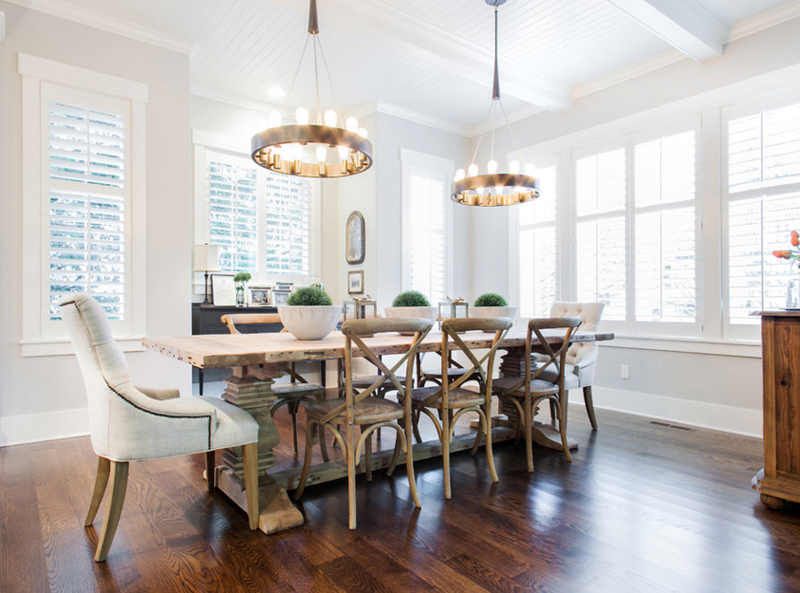 If you have already noticed, there are a couple of dining rooms in here that used ghost chairs because of how convenient it is for the owners or designers to mix and match it with the available table to be used in the space. 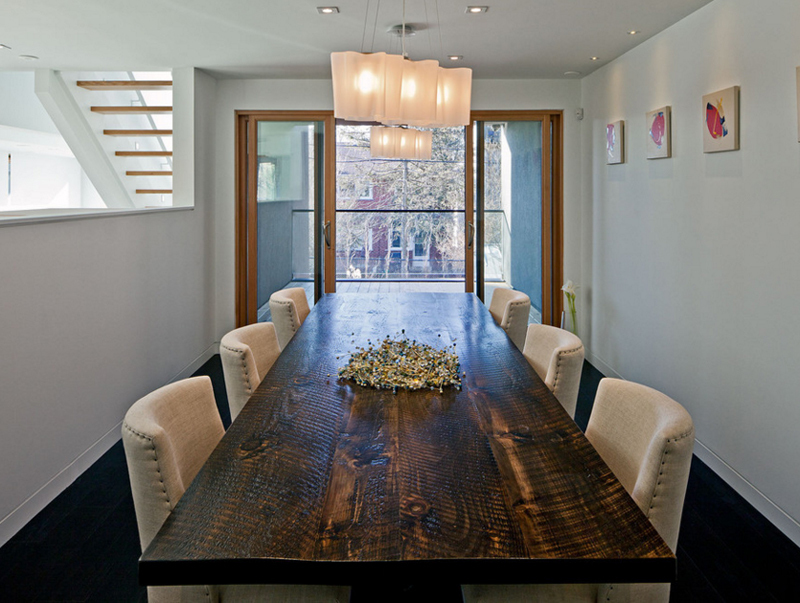 In here we ghost chairs paired with a stainless-glass table with a reclaimed wooden accent wall to complete the look. 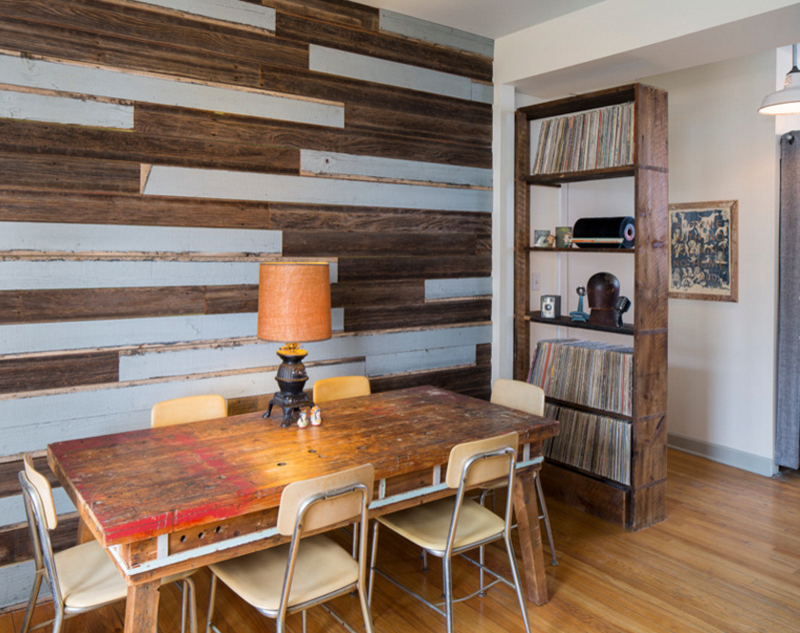 Like with the picture before this, the reclaimed wood was used as an accent wall. The dark colors that contrasts with the golden brown flooring complements with the dark colored dining room set – pretty weird combination seen in here, but I still love how the chandelier finishes the look of this space. Oh I love the wooden table in this Canadian home! It might be Maple for all I know, but I think it’s a possibility since Maple is a bit red-brown. 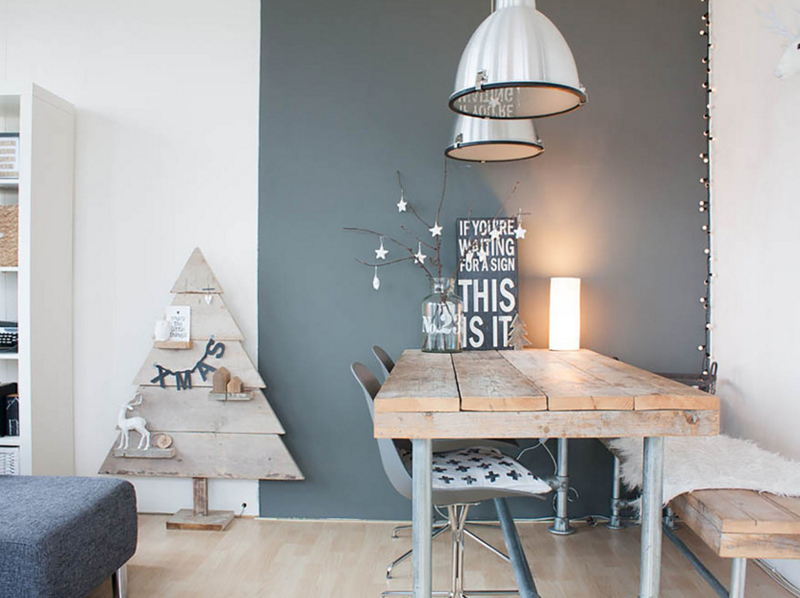 The contrast of the brown table and the white chairs is great too – it sure works all the time! Plus I think the pendant lights in here are great ones too. What do you think? Finally, last but not the list – one of the most cute and cuddle dining space in this particular list is a Scandinavian dining room! The details and aura of this space is just so comfortable and pretty much full of love. I can’t say for sure, but I think this space is so fancy because of that grey wall. My colleague wrote a list before about reclaimed wood being used in the bathroom and I think that it sure showcased a couple of lovely bathrooms with the best accent walls made from reclaimed wood and I think that the list I made today about the 20 Reclaimed Wood in the Dining Room is just as neat as the other one, check it out!